Our first extended cruise, with our first return customers! 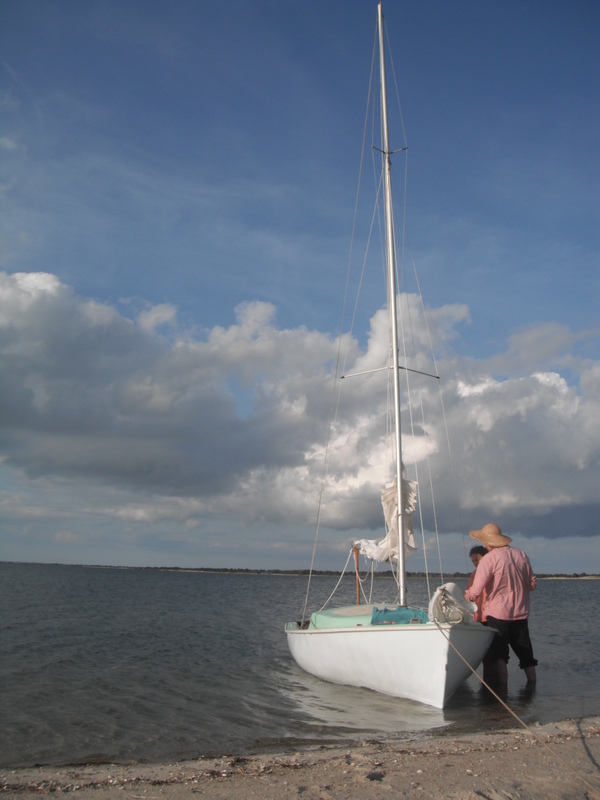 …we woke up early Sunday to catch the last of the ebb out into Buzzards Bay. We were moving slowly and so missed the tide, but the wind was already picking up nicely out of the southwest enough to let us beat the flood current with ease. 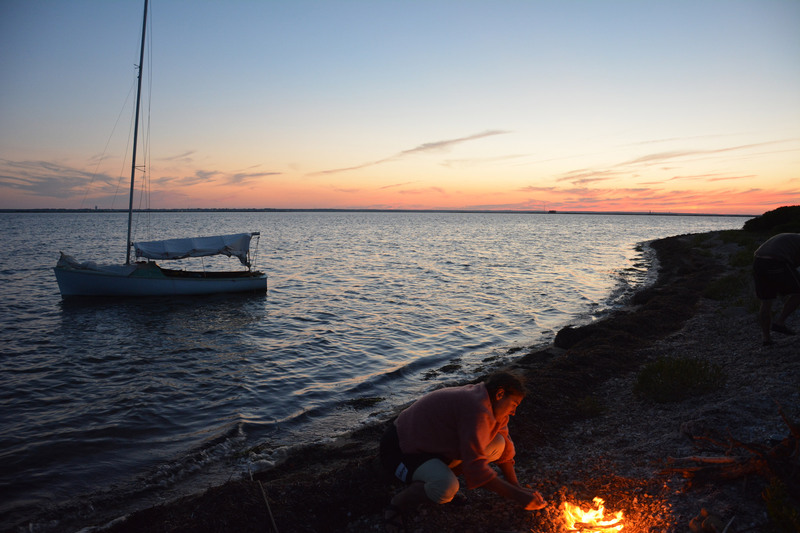 We were off to Cuttyhunk on a reach and then a long run inside the Elizabeth Islands to friendly Quissett Harbor, from which we strolled into Woods Hole for dinner and a beer. Crossing Vineyard Sound on day three. 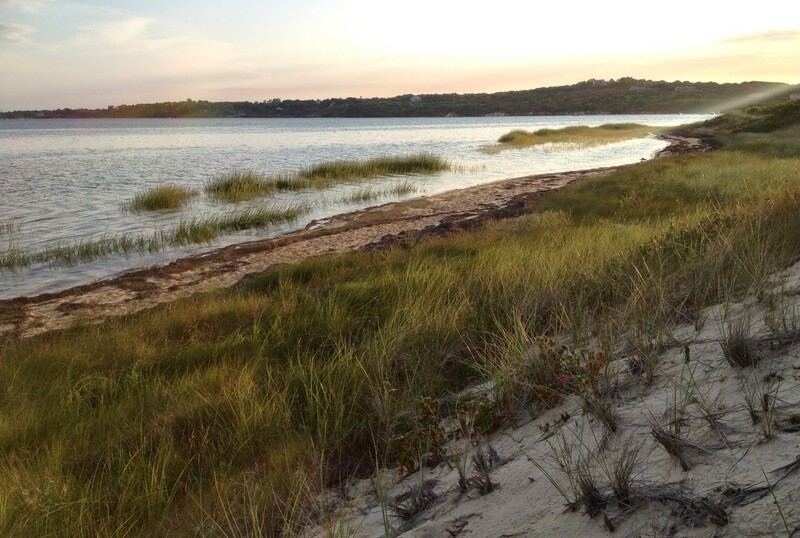 …let us make the gut into Cape Poge Bay on northern Chappaquiddick Island before mid afternoon, with a swim break on the way when the wind let up for a bit and the sun started getting serious. Inside Cape Poge Bay the day was capped by a happy meeting with Dana’s friends and a fine curry on the beach. The boat was then rowed across the phosphorescent waters of the bay and anchored off the low spit of Cape Poge Arm, where the breeze and clear skies allowed for sleeping under the incredible stars without a tent. 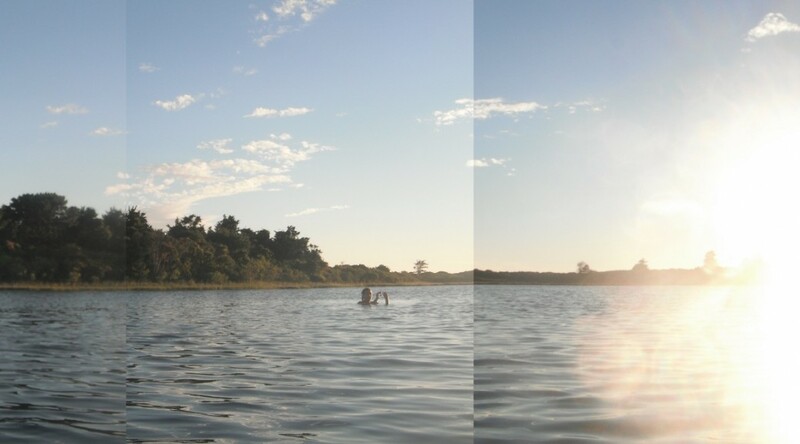 The next day we stayed in the bay, mounting the sunshade and doing a little rope work, but most of the day was spent in relaxation punctuated by swims and a little exploring of the wildlife refuge ashore. Dinner preparations at the non-presidential extremity of Martha’s Vineyard. On Wednesday we caught the ebb and a light northerly to Vineyard Haven, where we refreshed our water supply and enjoyed a shower and walk around town before sailing with the flood and into the building east breeze to Waquoit Bay on the south side of Cape Cod. 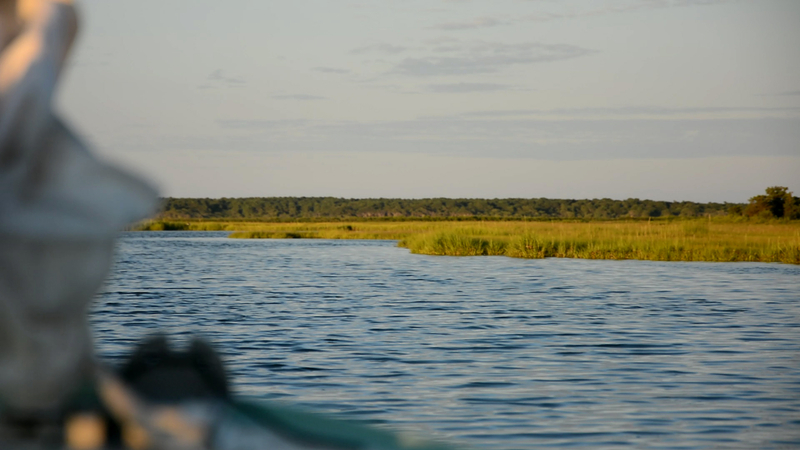 After sussing out a location for an instructor switch the next morning at the beach end of a long dirt road, we found our way into the marsh and a beautiful anchorage only the most shallow draft boat could access. 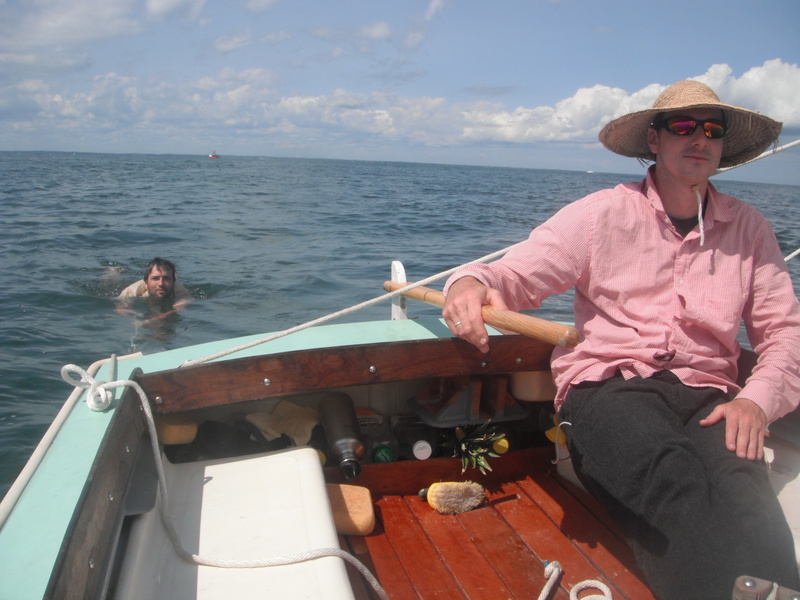 On Thursday morning Lu replaced Olaf, and we headed southwest into Vineyard Sound and for Menemsha. Along the way we ran into a Coast Guard cordon set up to protect the vacationing Obamas that kept us off the coast of Martha’s Vineyard. Not long thereafter, just as Dana was about to go for a swim, a very large shark showed up astern. Only a dorsal fin was visible, estimated by Dana to be 1.5′ wide where it met the water. The size and location, with seal colonies in the area, suggest a great white, though all present also describe the fin’s leading edge as quite upright. Secret Service shark sub? 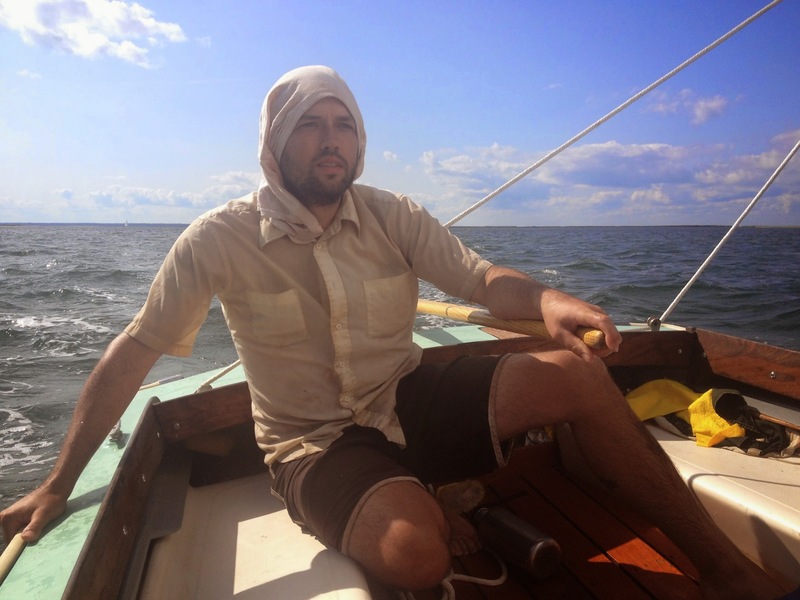 The following day we sailed north to Cuttyhunk. The wind was sparking up from the NE and Cuttyhunk Pond was filling up with sailboats as every weekend cruising boat in Buzzards Bay seized the opportunity to make it on a broad reach. We watched the anchorage and moorings fill up with sticks so that there were even a couple of boats on the moorings outside the pond, mashing up and down in the building breeze. After a walk around the island, a kind man rowed Dana across the harbor and stayed to gab. Before returning to his family aboard their Tartan, he gazed for a moment at our anchor sitting nonchalantly in 4 inches of water. “You are nicely tucked in here, aren’t you?” To detect his dinghy envy you have to have brought a twelve ton boat into a crowded anchorage, obliged to settle for a less ideal spot with poor mud for holding. All night long you waited nervously for the anchor to drag while the wind whistled in the shrouds and the boat sawed back and forth. In the morning, exhausted, you looked over at the dinghy cruisers who slept so well tied to a stick on shore. The world is full of peaceful places two feet deep. 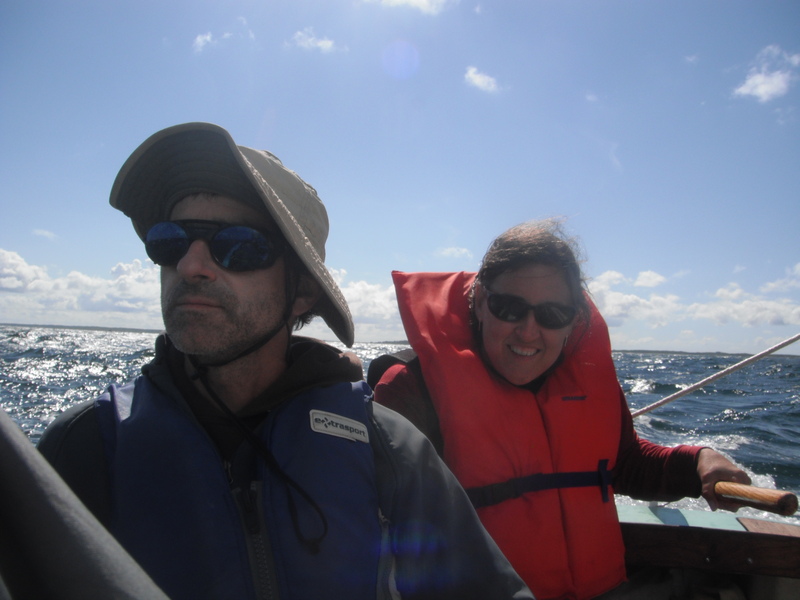 The final day was an exciting sail in a stiff Buzzards Bay chop back to Westport. We got in too early for the flood, and so had a walk on the beach before finally bringing the boat in. What a glorious sail!